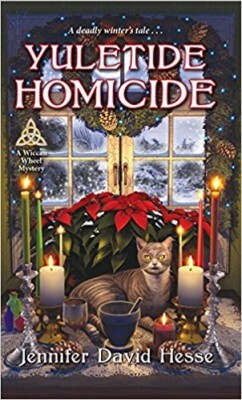 This week we have 5 more Christmas mysteries for your holiday reading-Hark the Herald Angels Slay: A Year-Round Christmas Mystery by Vicki Delany, Not a Creature was Purring: A Paws & Claws Mystery by Krista Davis, Slay Bells Ring: Caprice De Luca Home Staging Mystery by Karen Rose Smith, Yuletide Homicide: A Wiccan Wheel Mystery by Jennifer David Hesse, and The Ghost of Christmas Past: A Molly Murphy Mystery by Rhys Bowen. Details at the end of this post on how to enter to win a copy of all 4 books, along with links you can use to purchase them. In any town, but Rudolph, New York, Santa arriving on a flotilla the Saturday before July 25 could seem out of place. 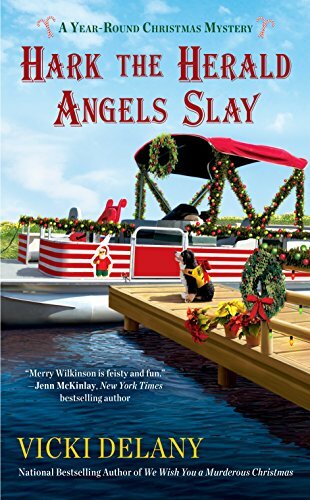 Instead, this is where Christmas is promoted year-round, and our heroine Merry Wilkinson’s own father is the designated Santa who will sail in on the shores of Lake Ontario. Merry left her life and job in Manhattan to return to Rudolph to open Mrs. Claus’s Treasures, but the reason she fled just landed on her doorstep. Max Folger has arrived in Rudolph to feature it in a Discover America travel story in Jennifer’s Lifestyle magazine, and he hasn’t come alone. Making an entrance is Erica Johnstone, granddaughter of the magazine’s owner, Merry’s former boss, and Max’s fiancé. Considering that Max ended his engagement to Merry through a text five minutes before announcing his impending marriage to Erica at a staff meeting, Merry shouldn’t be surprised that their first meeting together leads to a trending topic on Twitter. As business in Mrs. Claus’s increases due to the celebrity presence, Merry seems to be the only one in Rudolph who doesn’t welcome the magazine’s interest. At least, that’s until Merry returns to her store to find her assistant missing and Max in her office strangled to death with decorative cranberry beads. Pervasive gossip concludes that he missing Jackie O’Reilly was responsible for the murder, but Merry knows that her shallow and fame-obsessed employee could never commit such an act. Anyone who loves Christmas, or at least the idea of it, will appreciate a town that celebrates it year-round. Merry may not always feel the joy of the season, but her father and the other man in her life certainly do embrace the holiday spirit. Her friends assist in investigating those staying at the Yuletide Inn, while less important magazine staff are relegated to a nearby motel. Obviously, there’s some unhappy employees at Jennifer’s Lifestyle, many who object to the direction of the magazine as well as the new management. Intrigue abounds as Merry discovers that some of the residents have their own history with Erica, a woman who proves to have far more layers than one might expect. The development of characters is continually surprising, especially as Merry realizes how the murder has caused her to suspect and grill her own friends. This is a very fun mystery that exploits the gossip and small-town atmosphere of a small town in Upstate New York. Humor, not to mention Merry’s exuberant Saint Bernard puppy Matterhorn, will have even grumpy Grinches welcoming the thought of their own summer Christmas holiday. Ever since Wagtail, Virginia, rebranded itself as a destination spot for vacationers and their pets, the town has prospered through its pet-friendly businesses. This holiday season they are spreading their bounty through a sorta-secret Elf Squad who deliver gifts, services, and any suggested need made by thoughtful neighbors. Holly Miller, co-owner of the Sugar Maple Inn, is one of those designated elves, but it appears that a literal Grinch has emerged on the horizon. Or more specifically, over the house of Rupert Grimpley, where a 45-foot-tall inflatable Grinch looms over the neighborhood while questionable holiday music blares throughout the night. A more figurative Grinch arrives in the form of Norma Jeanne Blume, who along with the rest of her Thackleberry family, have descended on Wagtail to meet her impending in-laws. The demanding, self-involved Norma Jeanne would be hard to take even if her fiancé wasn’t Holly’s childhood sweetheart, Holmes Richardson. The Thackleberry patriarch is far more appealing and generous, but the CEO of a pet attire company has his own troubles what with rumors of his product causing allergic reactions, ungrateful children, and a villainous, shoplifting third wife. His problems are ended when Dale is found stabbed to death under the deflated Grinch, with suspicion quickly pointing towards Holly’s Aunt Birdie Dupuy. Her antipathy towards Rupert Grimpley’s green monster was well-known, and secrets over Aunt Birdie’s relationship with Dale will not be held long. It was Holly’s rescue Jack Russell terrier Trixie who used her nose for sniffing out corpses to discover Dale, but it will be the imperious calico Twinkletoes who leads them to clues. With Dale’s mother Doris forbidding her family to leave—or inherit any money—until the murderer is revealed, a countdown is started on solving the crime if anyone hopes to have a happy holiday. This is a delightful Christmas novel that explores family relationships while truly delving into the Thackleberry interactions. Of course, Dale’s wife Vivienne, Norma Jeanne, and her Instagram “trendsetter” cousin Blake are the absolute worst, but as the story plays out we are shown why. No character has just one side, and even the most irritating and unlikable become sympathetic. That doesn’t mean that readers won’t be rooting for Holly to find her own happy ending, or for Holmes to open his eyes and get a backbone. This is a novel of families, whether by blood or by love, and the furry companions who join them. This is mystery that will leave readers with warm hearts, and an appreciation of the stellar animals who choose to be a part of our family. As the week before Thanksgiving heralds in the holiday season, professional home stager Caprice De Luca prepares for Kismet, Pennsylvania’s annual Historic Homes Tour. It’s the perfect opportunity to showcase the home of Sara and Chris Merriweather, whose house is sure to be sold when highlighted with Caprice’s Christmas-themed decorations. After all, Chris is the town’s official Santa Claus, and his craft store sells many of his handmade toys. Chris is a close friend of Caprice’s father, so there’s no way she can refuse to help, even though Sara seems reluctant to sell their family home. No one can deny that the Vietnam Vet is acting erratically, but even the biggest Grinch could never have predicted the violence that would ensue with a decorative candy cane. The Merriweather family has their share of problems, with Chris’s PTSD from the Vietnam War resonating to present day. Secrets from the past are forced out into the open, with many being forced to confront their anger and regret. Through it all, Caprice succeeds in her practice of making the most of her home-decorating skills, which often include the same skills that help her to solve so many mysteries; simply listening to the needs of her clients and family. Despite this being a murder mystery, romance abounds during the holidays. Caprice is newly engaged to her brother’s law partner, Grant Weatherford, and having overcome their rocky past relationships and tragedies, the couple is finally together. Still waiting for news of Grant’s annulment so that they may be married in the church, Caprice needs to step up her game in finding the perfect retro fashion bridal dress. It looks as though the De Luca Thanksgiving dinner will be as chaotic, loving, and enormous as ever, with a multitude of family members and their respective significant (and possibly soon-to-be-significant ) others. This is why readers will enjoy this holiday-themed mystery, as the delightful interactions between the De Luca elders are models for a loving relationship. Just as integral is their four-legged family members, who are being blended together into households along with the new couples. This is a warm, funny, and romantic novel that delves into darker themes while maintaining the hopeful spirit of the holiday season. One would not expect a family law attorney to be a practicing Wiccan in Edindale, Illinois, so it shouldn’t be surprising that this is a secret Keli Milanni shares only with a trusted few. Being outed as a witch would probably not help her aspirations to make law partner, especially when she’s competing against her pompous and frequently annoying colleague, Crenshaw Davenport III. They’re going to have to get along when their boss Beverly Olen sends them to work undercover at the office of Harrison Properties, where they will attempt to discover a blackmailer. Beverly is adamant that the claims of financial impropriety against mayor candidate Edgar Harrison are false, but it’s also possible that she may be biased in his favor. When tragedy ends the festivities at Harrison Hotel’s renowned holiday ball, Beverly insists that they also end their investigation. Curious Keli has her doubts that the death was anything but accident, especially after being given an ominous warning through a vision by a Wiccan friend. Keli may be a solo practitioner who prefers to abstain from joining a coven, but she trusts the insight of the Wiccans who have proven to be eerily accurate. Although the magic comes mostly from intent and belief, an herbal supplement to coax a witness’s statement has hilarious results when a guilt-ridden Keli consumes the serum as well. It will take multiple chants and spell casting to unravel the tangled mix of corporate infighting, charming suspects, and financial shenanigans. Legal investigation is boosted by a few Wiccan spells in this charming third of the Wiccan Wheel Mystery series. Keli is possibly the most practical and grounded Wiccans one would ever expect to meet, using her altar to grant confidence, wisdom, and security. That’s not to say that a few visions won’t give her guidance as well, but it is the trail of financial records and legal documents that truly solve the crime. Keli herself faces the realization that photographer Wesley Callahan will soon become her longest-ever boyfriend, a relationship helped in no small part by their sharing her Wiccan secret. A blast from her past annoys more than inhibits her current status, but it does help her ongoing quest to discover the fate of her mysterious Aunt Josephine O’Malley. The Yuletide has a far different meaning for these Wiccans, with shortest day of the year marking a renewal and turning point in life. Wiccans and non-Wiccans alike will thoroughly enjoy this holiday-infused mystery, as it emphasizes the meaning of friendships and faith. This is a wonderfully unique series with just the right blend of humor, magic, and mystery. Molly Murphy series has grown to its seventeenth novel during which Molly herself has grown from a young Irish immigrant to be the proprietor of a detective agency to marriage to Captain Dan Sullivan and motherhood of a young boy. As this latest chapter begins she has suffered a miscarriage and cannot shake a severe depression as a result. Nothing that a good mystery can’t dispel! 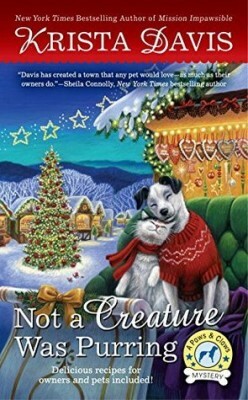 And just what the doctor ordered turns up when Sullivan’s mother visits a mansion of an old Dutch family on the Hudson, and Molly and her husband are invited up to Westchester for the Christmas holidays. Soon after they arrive, they learn that the three-year-old daughter of the couple owning the home had disappeared ten years before. Apparently, she wandered off and no clues or ransom note ever turned up. Molly empathizes with the mother and immediately wants to solve the case. But how? And then on Christmas Eve, lo and behold, a young girl knocks on the door claiming to be the missing daughter. The plot then has Molly (who suspects the family has withheld vital facts) following her intuition (with a little help from her detective husband) to reach a joyful but improbable conclusion. The entire series from first to last is a joy. In any event, this novel is not really a crime story as usual, but is an interesting tale as well as a look at Molly’s evolving development as a character, her relationship with her husband and child, and as her growth as a person, and is recommended. To enter to win a copy of all 5 books, simply email KRL at krlcontests@gmail[dot]com by replacing the [dot] with a period, and with the subject line “more christmas,” or comment on this article. A winner will be chosen December 16, 2017. U.S. residents only. If entering via email please include your mailing address, and if via comment please include your email address. I haven’t read a Christmas themed book all year. What a great start this would be, thanks! This is a great selection of books! Thanks for the giveaway! This looks great, I love Christmas themed books. Thanks again for the giveaways! favorites. I’d love to win this collection. Holiday stories are always fun. 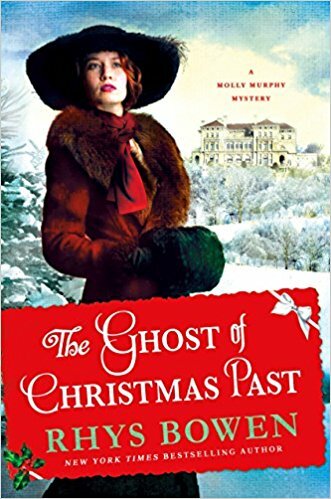 Great batch of Holiday Mysteries, some from my favorite authors and two new to me authors. Thanks and Merry Christmas to all! karen94066 at aol dot com. 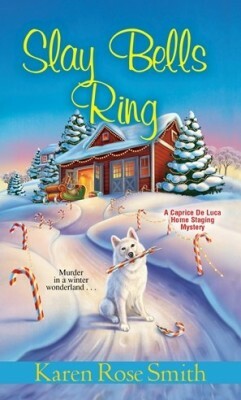 What a fantastic collection of seasonal themed mysteries. Merry Christmas to every one! It would be great to win 5 mysteries for Christmas! Wow, it would be great to have so many Christmas cozies to read. Thanks for the chance. What a great giveaway! Lovely selection of books!! Sounds like a wonderful holiday selection. Wow! What a great selection of Christmas books. Really enjoy reading Christmas books this time of year. Thanks for the chance. Wow! They all look like GREAT reading for the holidays, thanks for offering to us! I would love a chance to add these books to my library. Thank you for the chance. What a lovely gesture! Thank you so very much for this wonderful giveaway. Best Christmas gift ever! I love the Molly Murphy series. The others sound good too. I love animal cozies.